A mole is an accumulation of pigments, colorants on the skin: melanin and melanocytes. The main danger of performing aggressive procedures, which include hair removal, is possibility of damaging the "bad" mole. What is a "bad" birthmark? • C-color. There is nothing to worry about if a mole has an even color and is single-toned. Changes in color call for additional diagnosis with a dermatologist. • S-size. 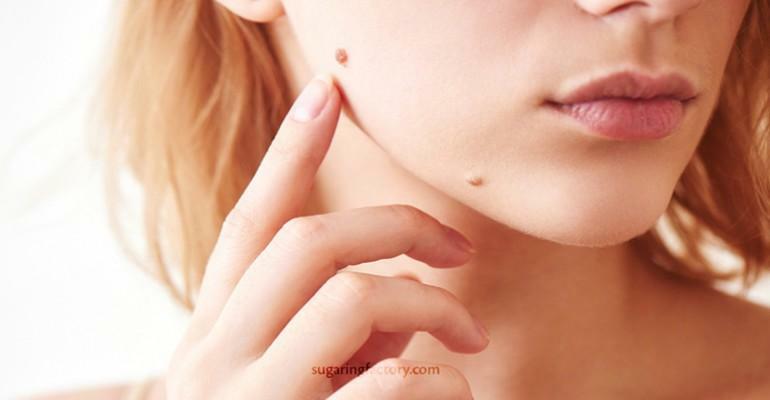 Moles, not exceeding 6 mm (0.2 inches) in diameter can be classified as good, otherwise it is better to see a doctor. Damaging a mole increases the risk of developing a tumor. • D-dynamics. If a mole doesn’t change for a long time ( there is no growth, discoloration, peeling, crusts, bleeding)it doesn’t require additional monitoring or tests. Epilation around the mole: for or against it? • if hair removal is performed by an inexperienced practitioner. The main thing to remember is that it's better to visit a dermatologist beforehand and get a specialist's advice before the sugaring procedure.